The situation in the mango market is unstable. The strikes in France are spoiling the end of the Spanish season. Due to the roadblocks, the mangoes have been arriving late to their destinations in Europe. All in all, growers are looking back on an unusual season. In Peru, growers have stopped working because they want higher prices. The talks will continue on Monday 2 December. Until then, no mangoes will be sold. Other countries, such as Venezuela, the Dominican Republic and China, are investing in cultivation and export. South African growers get a good price from the processing industry and therefore deliver the largest part of the production to those plants. The dialogue between exporters aimed at improving the fruit's price will continue at the start of December. According to the Minister of Agriculture, the strike is over after talking with the growers in Tambogrande, Las Lomas and Sullana. The growers had stopped working for 48 hours because of the low mango prices. Because of the smaller harvest, growers had hoped for a better price. "We are at the beginning of the season and we have low prices. The mango harvest has been reduced by 50%, so of course, there were hopes for higher prices," said the minister. Until Monday, when the talks will continue, no mangoes will be sold. The province of Casma recently received permission to export to Chile. The first shipments will be made at the end of January. Exports also go to other destinations, such as the Netherlands, Indonesia, Russia, France, Italy and Germany. Up to week 46, 2,360 tons of mangoes were exported. That is a little more than the 2,255 tons that were shipped in the same week a year earlier. This early in the season, the main destinations are the US (27%), Chile (22%), Canada (20%) and the UK (19%). The country is expected to export 171,000 tons of mangoes this season, which is 20% less than last year. The season kicks off in February with the Haden and continues until June. The Kent takes over in the summer months. For the coming season, the biggest challenge is to ship a container to Europe, says an exporter. A minimum of 60,000 kilos of mangoes are expected per month, 5,000 of which are shipped by plane. Spain is the most important export market, says a trader who recently attended Madrid's Fruit Attraction. He also sees opportunities in Asia. Negotiations are also underway to export to Hong Kong and Dubai. "Our objective is to be able to export weekly to these markets throughout the season." 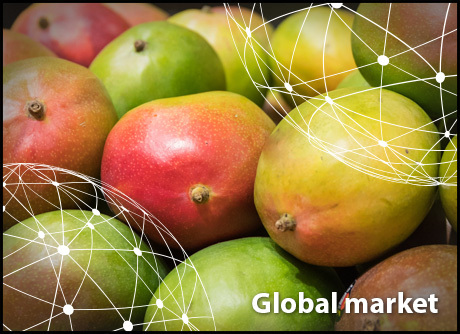 Given the early bloom and the development on the plantations in the Soconusco region, the first mangoes will be available at a time when there is yet no demand on the world market. That is why sales for the early harvest are being sought on the domestic market. The temperatures in November were the reason for this early bloom. Moreover, there was less rain. Yet the prospects are good, because thanks to the early flowering period, a second bloom could follow later in the season. The growers think that they will have a sufficient volume even if there is demand from the US, Canada and Europe. The season will probably start in February and last until May. The government has invested 130 million pesos (€ 2.3 million) in the professionalization of mango cultivation and aims for exports to double next year. The government wants to gradually increase mango exports to the US. The money is invested both in cultivation and in post-harvest packaging and sorting. The mango season has just started in the Onderberg region in Mpumalanga. The volumes intended for commercial distribution are expected to be comparable to the 80,000 tons harvested last year. There are many informal growers who are not registered with the South African Mango Growers' Association, so the total mango harvest is considerably greater. A few days with high temperatures during the flowering period and a shortage of rain in the summer could have an impact on the yield. The conditions in the juice market are not too good, so in addition to the sales on the fresh market, many growers will choose to supply the mangoes to the atchar industry (a hot spice). According to the estimates, half of the harvest is delivered to that industry. Those mangos are delivered green and unripe to the atchar factories, which means that the fruit hangs on the trees for half as long as the mangoes for the fresh market. This also entails that the need for plant protection products is also halved. South Africa exports only a limited amount of mangoes, roughly about 5% of the production. This year, Brazilian Tommy Atkins mangoes were imported for the first time in the off-season, but the high prices fail to attract consumers. Mangoes are a popular product on the Chinese market, so more and more companies are starting to grow them in China. The market is able to handle it, because the demand remains high. This year, there was a mango disease in Sichuan, so the mangoes quickly turned black after ripening. If not tackled on time, the fruit is immediately affected. In other production areas, such as Guangxi and Hainan, they did not suffer from this disease. Luckily, it can be treated, so not all stocks will necessarily be lost, but the producer has to act on time. Mangoes are also imported from India and Vietnam, Thailand and Myanmar. They are transported by sea, air freight and by truck. The use of air freight is on the rise. The volume of mangoes exported from Vietnam to China is growing every year and this also has an impact on the price of mangoes, which fell in the beginning of the season due to the large supply. With the last Keitt to be harvested in Malaga, the Spanish season is nearing its end. The subtropical part of Spain is the most important growing area for mangoes. The sector is still profiting from the big weeks leading up to Christmas, although the season's development has been unusual. Persistent rains and the strikes in France are two factors that have marked the season. The campaign kicked off with a delay of more than 15 days due to the ongoing rains, "which is something very unusual in this region," according to one exporter. The rain did not cause major damage to the harvest. In 2018, the country is producing about 30% more mangoes than last year. 20% of this growth is the result of new plantings that are now coming into production. The remaining 10% is probably the result of an above-average yield. The prices have fallen, under pressure from the larger supply. According to a trader, the price is on average 30% lower. The strikes in France were an unforeseen factor that has made the marketing more difficult. "There have been delays in the departure of batches for European customers," says an exporter. "In some cases, the fruit did not arrive with the quality the customers expected." During the strikes, this trader lost 50% of the volume. "Retailers always need to have the product on the shelves, so some have switched to, for example, Brazilian imports." The production is expected to continue growing in the coming years. As long as the weather conditions are suitable, there will be a larger volume every year. The Osteen is the most planted variety and its production takes place within a few weeks. "The question for the future is whether the market will have the capacity to absorb that volume." The mango market is facing an interesting month in December. Although the market conditions have been very tough in recent weeks, there are now a number of factors that could result in a turnaround. For example, the cultivation in Peru has been delayed by 2-3 weeks due to the colder weather and the prospect is for the mangoes to hardly make it for January this year. Furthermore, since last Thursday, the growers have stopped working in the cultivations areas of Tambo Grande, Piura. All roads in the area are closed, so it's not possible to access the plantations. The negotiations will continue on Monday. This can also cause a further delay of the shipments. At the same time, the volumes from Brazil are sharply declining. Large volumes are expected to become available by mid-December. Importers are therefore certain that the prices will reach attractive levels. The Peruvian mango season normally kicks off at the end of December/beginning of January, but the strikes held this week in Peru have generated some uncertainty and caused a slight delay in the start. The strikes had been announced for Monday and Tuesday, but it appears that they will last a whole week. According to information from Peru, the harvesting, sorting and packing of the mangoes should start next week, which is 1 to 2 weeks later than initially planned. The situation on the mango market is not easy. "From one day to another, the market for Peruvian mangoes has lost all dynamism," says a trader. "We assume that it will pick up again during the month of December, when consumers buy a lot of exotic products again." According to the trader, consumers care a lot about the quality of mangoes. In recent years, he has seen a rising demand for ready-to-eat mangoes shipped by plane. In the German wholesale market, the Brazilian Kent mangoes currently hold a dominant position. The goods that are flown in by plane are qualitatively at their best and are clearly more popular than the regular batches. Prices have remained stable overall. Worthy of note is the growing interest in Spanish mangoes. In Munich, and also recently in Leipzig, for example, these mangoes, marketed under the Sigfrido brand, are in high demand. The traders who are currently working on this segment expect more wholesalers to join in the short term. Also, it is reported that mango consumption continues to grow. The current quality requirements are said to be very strict in comparison with 10-20 years ago. The importance of quality ready-to-eat and convenience packaging is increasingly greater. The import volume of mangoes for the winter season seems to be slightly lower than last year. A trader expects smaller volumes from Ecuador. That country kicked off the season in September with the Ataulfo, Tommy and Kent. The South American country will remain on the market until the end of December. Then Peru takes over the market, but there too a smaller harvest is expected. Exporters are therefore looking into other suppliers, including Brazil, Mexico and the Dominican Republic. "The prices for the large calibres are good," says a trader. The price oscillates between 10 and 12 dollars per box for sizes 12 and 14.